Indian Coast Guard invites Application for the post of Assistant Commandant (Group ‘A’ Gazetted Officers) for SC/ST Categories. Apply before 20 May 2017. Selection Process : Selection will be based on Mental Ability Test/ Cognitive Aptitude Test and Picture Perception & Discussion Test (PP&DT). 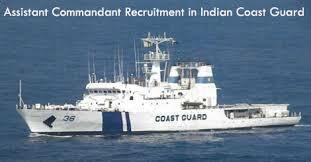 How to Apply Indian Coast Guard Apply : Interested candidate may apply Online through the website http://www.joinindiancoastguard.gov.in from 13.05.2017 to 20.05.2017.